I've been really interested in the thermal polishes lately and Born Pretty Store seem to have an ample range of them, today I am trying out their grey to white thermal, which is also a peel off polish, so it's a twofer. The cold state for this polish is a slate grey that looks almost like a matte, leathery finish in this photo. The warm state, (which I had trouble getting naturally because of my recently acquired chronically cold hands and feet, so I had the help of warm water for this shot) is an ever so slightly greyish white that is surprisingly shiny considering how the grey/cold state looks. You can see on my thumb especially that the transition creates a cool cloudy effect. I added a stamp to it using Barry M Chai which is roughly the same colour as the grey, not as good as some of the other nail art using thermals out there but I gave it a good go and I really like the fact that most of the time the stamp isn't visible then it can suddenly appear. The polish has a pretty good formula which applied nicely, it does smell like PVA Glue but I am guessing that is the peel off part of it. It dried quickly and you could quite easily get away with 1 coat in a rush but in the warm state, the white looks a little patchy so I recommend 2 coats. Clean up was a doddle because any bits on the skin or cuticles just peel right off without any hassle. I wore it without any topcoat, I know, rookie mistake, overnight it got loads of tip wear and a few chips so it would work best with a topcoat if you want it to last longer. When it came to peeling it off, it did come off without causing any damage to my nail surface but it came off in lots of chunks rather than one nice peel. If you would like to try this polish, you can find it here for £6.27/$8.92 and if you'd like to try a thermal but grey isn't your colour then check out the other ones, there are plenty to choose from here. 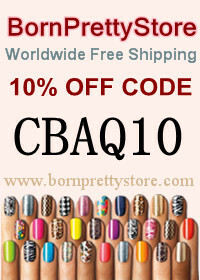 Don't forget that you can use my code CBAQ10 for 10% off any non sale items.